This week, I'd like to introduce you to Miss Sadie. 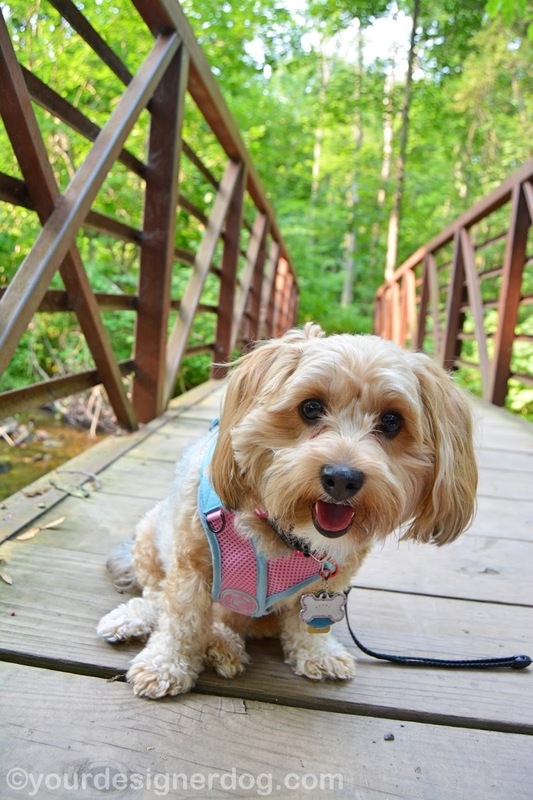 Sadie is a 3 year old Yorkipoo, which means she's half Yorkshire Terrier and half Miniature Poodle. Sadie is a girl dog that likes the color pink and dislikes getting wet and dirty in mud and rain. Sadie was born to rural life, but now lives in the city. "I was born on an Amish farm in Pennsylvania. My first few weeks of life were spent without electricity running around chasing chickens. I rode to my first vet visit on a horse and buggy. But now I'm a city dog, living in a house with my Mom that's ten miles outside New York City." "I'm a pawsome pet because Mommy's whole life is different because of me. Before I came along Mommy was terrified of dogs and had very bad allergies. Since I have poodle hair and don't shed, Mommy isn't allergic to me. Mommy actually cried the first night I slept in the bed with her because she never thought it would be possible to be so close to an animal. 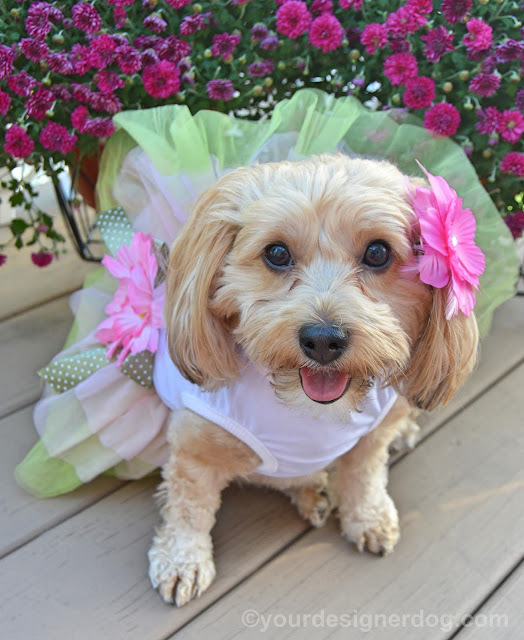 Now Mommy loves anything to do with dogs and goes with me to all kinds of doggie events and has discovered the world of pet blogging." In her spare time, Sadie enjoys playing with her favorite toys. But only the new ones... every girl likes new things, right?! 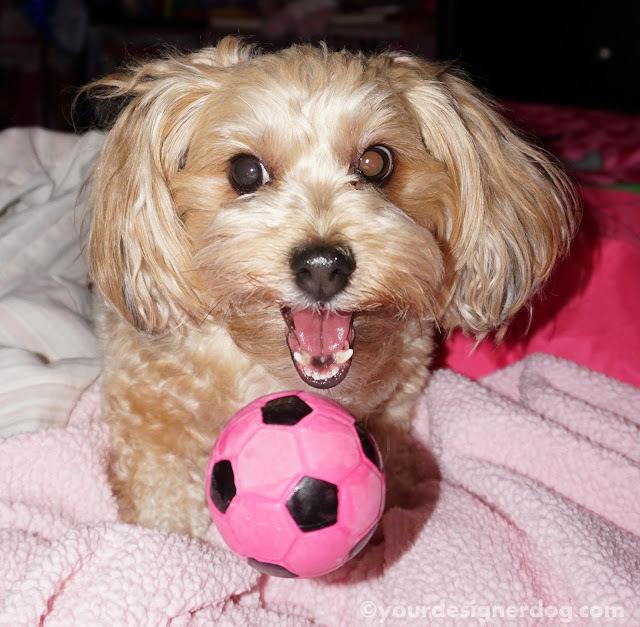 "My favorite thing to do is play with one of my little squeaky soccer balls, but only when they are new. I pout if Mommy won't give me a brand new ball every day. But when I get a new ball I will play for hours squeaking and chasing and playing catch. I absolutely love when Mommy puts my ball in a box or wraps it up in a blanket and I need to figure out how to get it out again." Sadie enjoys variety when it comes to her food. I'll admit, I get tired of eating the same stuff all the time too and Sadie has a very good point. "I go through phases a lot, so my favorite food changes pretty often. I mean don't you get sick of eating the same thing all the time? But right now I'm obsessed with Rachel Ray soup bones. My Mom says they are made for bigger dogs so she only lets me eat one small piece every day, but I would eat a million of them if I could." Sadie is also a talented little dog. Apparently, she has some pretty good aim with a ball and loves to play catch. "My best talent is playing catch. Why would I want to play fetch like other dogs and actually run around chasing a ball when I can sit on the couch and play catch? My Mom throws me a ball and I hit it directly back to her with my nose. Mom says my aim is better than most little kids." When Sadie isn't busy playing with squeaky soccer balls, eating Rachael Ray Soup Bones, and catching balls, she goes to work with her Mom. She's an office dog whose job is to entertain everyone else that works there. "I love surprising my coworkers by putting bones in their shoes or purses." You can find more of Sadie at her blog - Your Designer Dog. She's also on Facebook, Twitter, and Instagram so be sure to stop by one or all of those places and say hello to her! We'll see you all back here next week for another edition of Pawsome Pet of the Week! That Sadie is such a cutie pie and she sure has a pretty smile! Mom Kim here - Sadie is a beautiful Yourki-Poo, I love her color. I had a little Yorki-Poo named Oreo - he was all black with a white spot on his chest. He had very few toys that he liked except for a little knobby green squiaky toy. Wadie is a cutie-patootie, especially in her dress and the flower in her hair. Sadie is so adorable! We love, love, love her smile!